The WHF Winter CSA will run from November 25th – April 10th – a total of 16 Weekly Shares or 8 Bi-Weekly Shares! We’re offering two Winter CSA options: Weekly for $756 & Bi-Weekly for $432. Spread the good word! Word of mouth is the best way to help us grow and sustain our small farm. Please share the link, forward this email and encourage interested friends, family, neighbors & community etc… in signing up for their CSA share. Many thanks for your help from all of us at Working Hands. 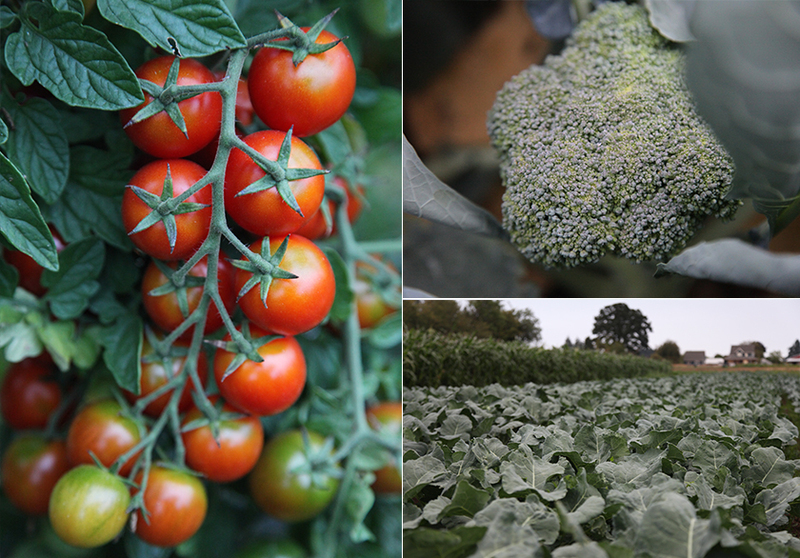 Sakura cherry tomatoes ripening on the vine and the first of the fall broccoli emerging..
Now onto some updates from the farm! In order to avoid the hotter part of the day especially with fresh harvest we’ve been getting up at 5:00/5:30am and have been getting harvest done by noon which makes a huge difference. The temperature between the hours of 11-noon spike 10 degrees so it’s important for the veggies (and the farmers) that everything be washed and chilled before then. The pole building has been amazing throughout the hot summer. We’ve been opening it up in the early morning hours to cool things off and then close it up to keep it passively cool throughout the day. It’s been averaging 80 degrees in there while it’s 95-100 degrees outside so we’ve been pretty happy about that. Not to mention the super chilled veggies + insulated building have been keeping the veggies cool during CSA pick ups. That’s a big win-win! 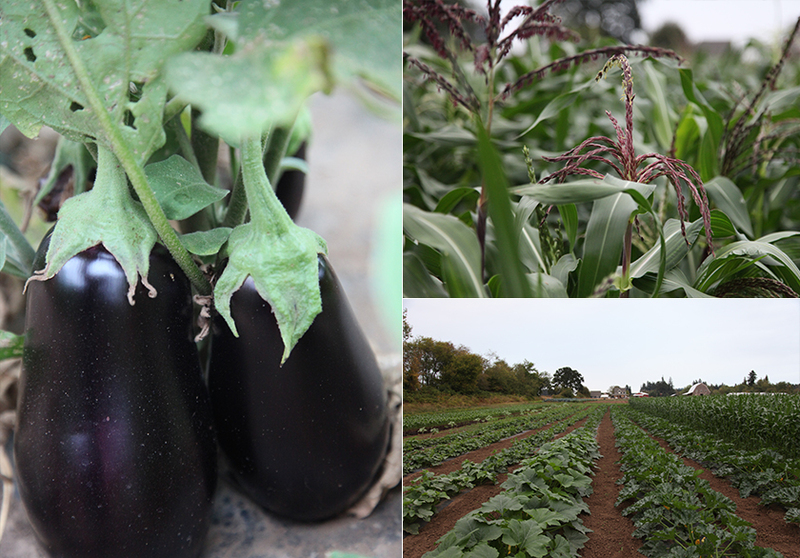 Eggplant season is upon us, painted mountain dry corn tasseling up, and the last succession of squash coming along.. This hotter weather is giving us major flashbacks to the 2015 growing season (el nino) and the (previously) hottest summer ever. We are better prepared for it this time around but working in the heat is no joke. Our biggest priority is watering and keeping all the plants roots cool. We use the kifco water reel and drip tape for irrigation… we have been staying on top of giving the plants a nice deep soak. Brian has been managing the irrigation this summer and we’ve been working out the kinks integrating the new water reel system. A lot of the crops (tomatoes, peppers, sweet potatoes, squash, melons, cukes etc) are on drip tape but the majority are overhead watered. Setting up the reel is usually a one person job but moving lay flat hose around the farm is no joke (who needs cross fit when you have farm fit…) We’re making good notes now though to have for next season and how we’d like to do things more efficiently (having a few main arteries of layflat set up around the farm so they don’t move during the season.. that way it’s easy to plug into). Having the irrigation all set up and ready to go under the plant also helps us to maintain some balance with the extremes that this season’s weather brings! Feeling prepared and ready is worth it’s weight in gold when it comes to extreme weather events etc especially with the pattern of extremely dry and hot summers. 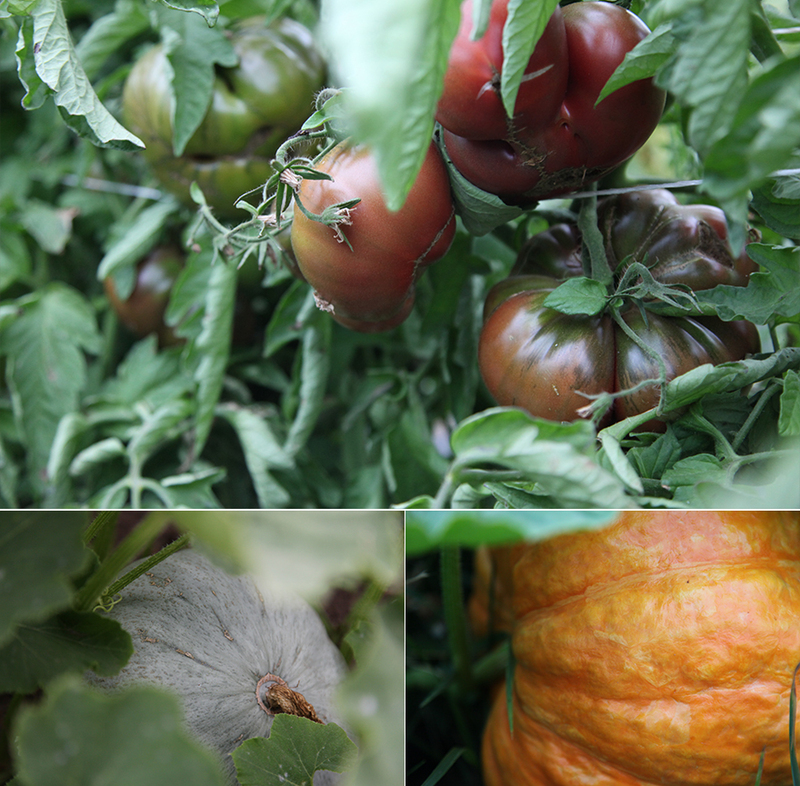 Heirlooms ripening on the vine and the winter squash is maturing in the field..
Over the past month we’ve been planting up a storm! We planted out a few rounds of Fall crops: kale, romanesco, cauliflower, broccoli and cabbage– over 7600 row ft/6100 plants!!!! We still have loads more to plant over the next few weekends… storage crops, roots, our third and final fall succession of broccoli, cauliflower and romanesco etc. So. Many. Plants. 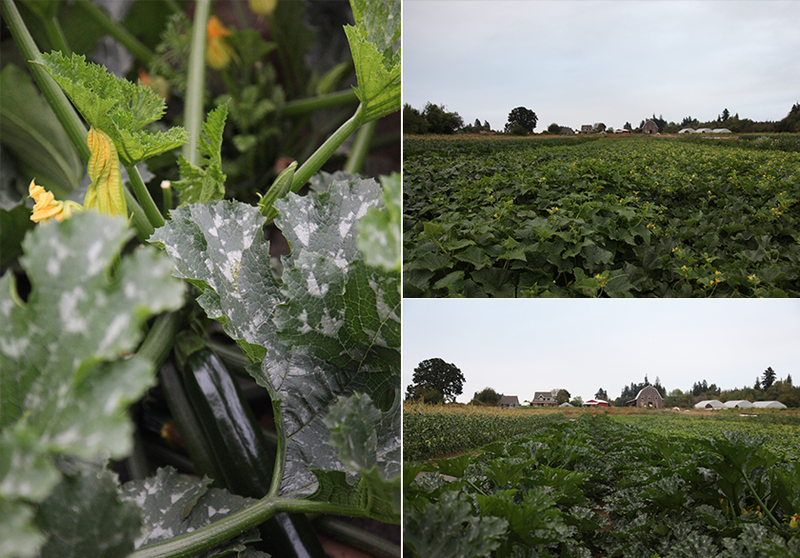 We started our overwintering crops last month– purple sprouting broccoli, cabbage and cauliflower too! And got our final round of overwintering storage carrots seeded (1,800 row ft) that we flamed last week. Our big bulk harvest of onions happened a few weekends ago… over 20,000 storage onions and beautiful cipollini and shallots for winter CSA! We’ll be moving on to bulk harvest of potatoes this coming up this week and next… it will sure feel good to continue to bring in those major crops. So many things to look forward to checking off the list! July, August and September are the peak of the season for us.. our biggest planting pushes for Fall and Winter as well as the heavy harvests of summer and fall. In the midst of all the excitement it’s always important to take a moment and appreciate what we’re accomplishing on the farm… We’re farming over 13 acres this season and we’re set to harvest well over 100,000lbs of veggies (that doesn’t even include the Winter CSA) in just the Spring/Summer/Fall season alone/feeding over 600 individuals. It feels pretty darn amazing. Zucchinis in the field, the second succession of melons and views from the bottom of the farm.. In order to sustainably farm through the crazy summer’s it’s important for us to check in with ourselves and one another. To recognize when the day is done and if we need breaks or a moment to ourselves (that doesn’t involve farming etc). We prioritize eating as many delicious homemade meals that we can (it’d be impossible to do what we do without proper nourishment!) We do our best to dole out high fives, check in with each other and tell each other that their doing an amazing job. We’re definitely getting closer to what the big picture answer is in relation to the workload that we currently have going and we are confident that in the foreseeable future the balance will come and our goals will realign more than ever before. We certainly know what we can accomplish when the two of us put our heads together… now more than ever it just feels right to reel it in and realign! 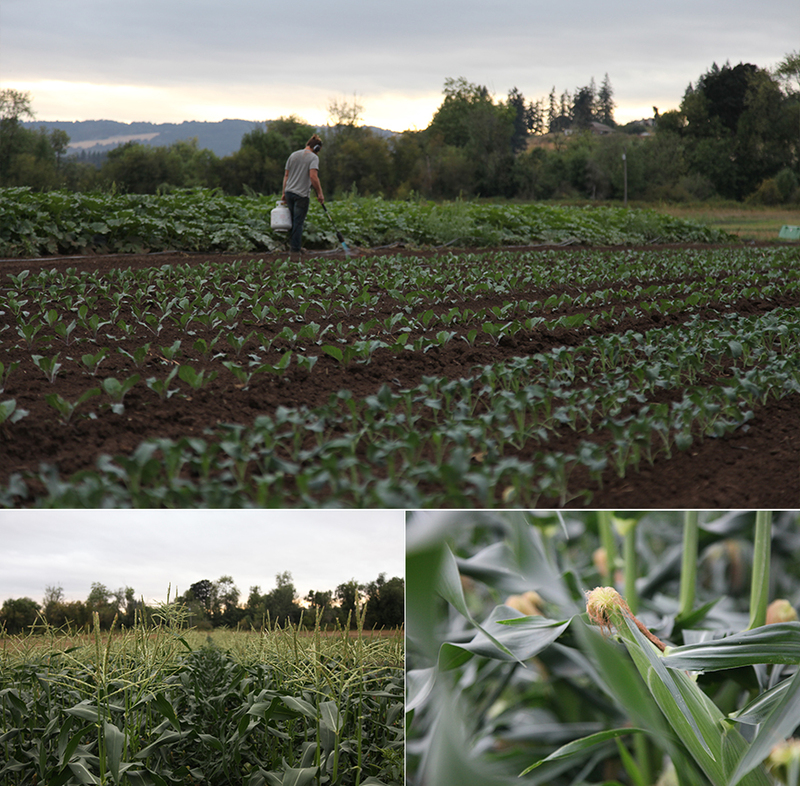 We’re in it for the long haul and we love growing and raising the best possible food for our community that we can. A BIG THANK YOU to our members and surrounding community all for your encouragement and excitement this season! We’ve seriously loved every second of it and it truly makes our day when we see what everyone is cooking up in the CSA Member Page. It connects all the dots. 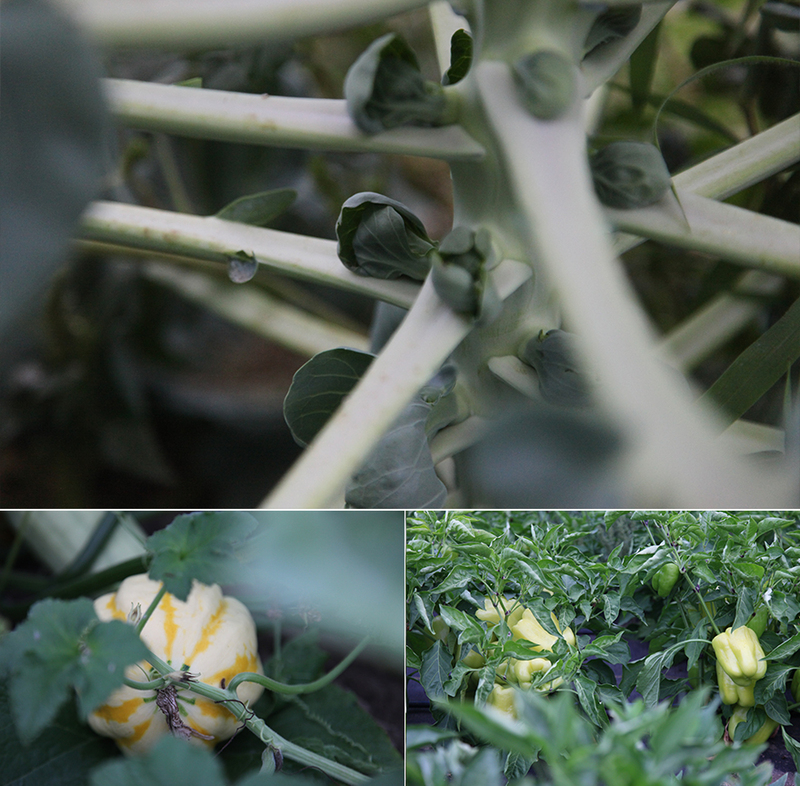 Brussel sprouts are maturing, the gourds are getting color and we are waiting patiently for the bell peppers to turn colors! Full Hearts. We also celebrated our four year anniversary as a married couple at the beginning of the month. Hard to believe we even pulled off getting married in the beginning of August (it’s just too crazy to think about). Thank goodness for all the friends and family who came and lent a hand the days leading up to it… I always think fondly of that time and experience and it’s definitely one of my favorite memories of our wedding. Besides marrying my best friend, of course. So many things have happened in the course of 4 years of marriage (+the 3 1/2 years before that). Its been a wild ride and I feel so thankful that I have someone like Brian to move through these days with – there sure is something special and sacred that we share between us and I thank my lucky stars for the universe bringing us together. Farming is a mutual passion for both of us and one of the main reasons our paths first crossed. He is my other half (sometimes my better half) and my favorite person and I feel so lucky to walk through this life with him. As he once said to me just a week or so after being married, “It does feel different being married. It feels complete.” This man, this place, us. To begin and end my days with him makes all of life’s sweetness even sweeter. We live, we work, we grow and we flourish – together. It’s a beautiful and quick lifetime here on Earth.. and he is my constant reminder to enjoy every second of it. 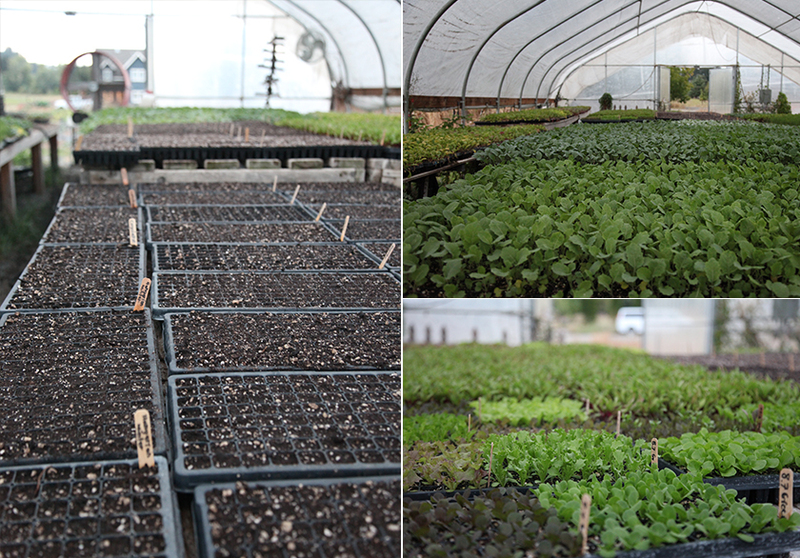 Late summer starts, the rest of the Fall and winter crops waiting for their planting date and tasty greens! September also marks the month of some of our favorite veggies and shares! We will be slowly transitioning into our cooler weather crops. The summer crops are still bumpin’ but as the days get shorter and the nights get cooler the Fall veggies will start to shine providing a delicious balance of the two seasons. The summer harvests have been so plentiful… we’re looking forward to the shorter days, to give these farmer bodies a little bit of re-coop time. This is the time of the season where our backs feel it the most – 50 lb -70lb harvest crates x 3 days (and 200 households) can add up to a lot of pounds of produce being harvested, washed and displayed. Speaking of summer bounty! Our Bulk Tomatoes are now available (get em while they are here!) and should be around for the month of August/through mid-September (weather dependent, of course). This is the 7th season in a row that we have had offered this unbelievable deal! Please see below for details. Farmer’s tip: A super simple way to put up tomatoes without the canning/processing is… FREEZING! These bulk maters are great for freezing whole in gallon bags to enjoy the summer bounty year round! We hope you all enjoy this week’s bounty and have a great long weekend! 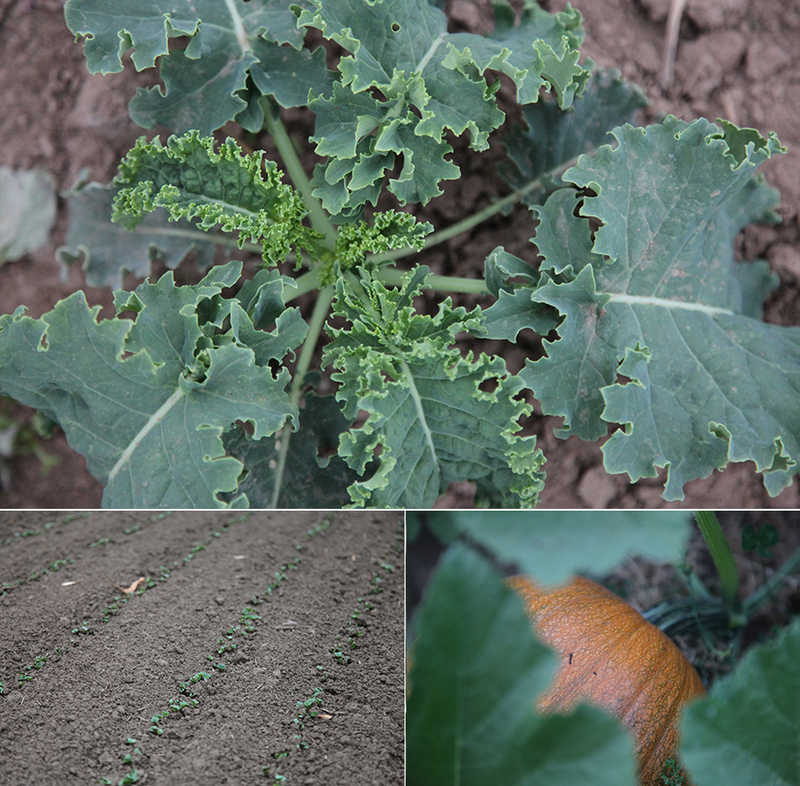 Fall kale is growing fast, the first of the fall radishes are up and the pie pumpkins are turning colors!